Of all the roadnames offered by AHM on its U25C, the Santa Fe example is the one absolutely non-prototype. Decorated in passenger red and silver and carrying ATSF roadnumber 350, this c-truck boat appears to have taken its looks from the GE U28CG. Santa Fe bought ten and owned the only U28CG diesels built in 1966. These Santa Fe U28CG's originally wored the red and silver dress and were numbered in the 350-series, as is found on the AHM U25C. This C-truck General Electric U-Boat was introduced in the 1965 with three roadnames (Pennsy, Northern Pacific, and CB&Q). 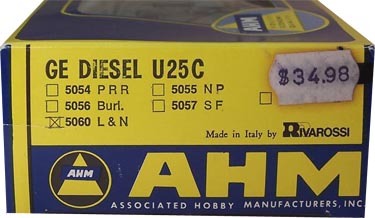 Built by Rivarossi for AHM, the U25-C originally sold for $16.95 for the Powered version. 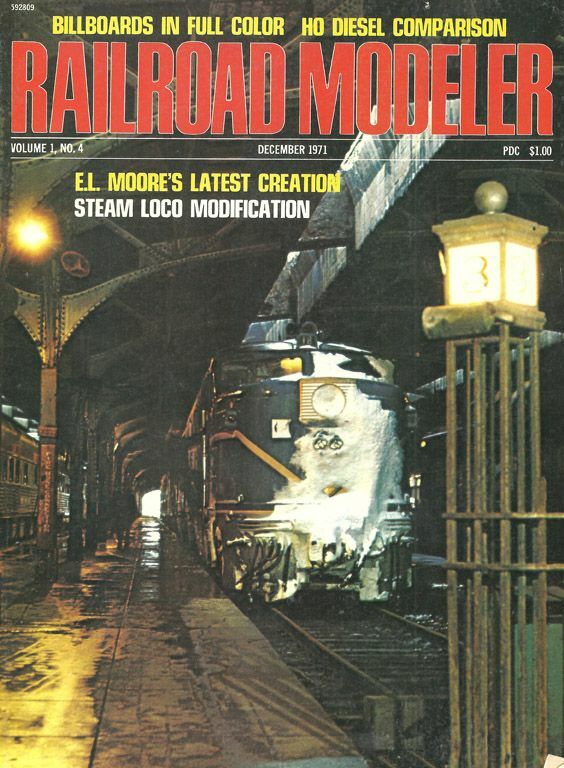 You'll find a review of the original AHM U25-C in the June 1966 issue of Model Railroader. The review is positive of the model and notes its scale speed range was 6 mph to 170 mph. The review does point out the weakness of the thick metal stamped handrails and knocks the deep flanges. The 1977 retail for the U25-C was $39.98. AHM also offered a set with a powered and non-powered example in the '70s that retailed for $49.96. By the 1980 AHM Catalog, the U25-C is gone. Rivarossi did offer this model again in the '80s under their own name. To my knowledge, the Rivarossi offering did not include any roadnames that were different from those produced for AHM. The original buyers of the General Electric U25C included: Atlantic Coast Line; Chicago, Burlington & Quincy; Lake Superior & Ishpeming Railroad; Louisville & Nashville; Northern Pacific; Oro Dam Project; and the Pennsylvania Railroad. GE built 113 examples of the U25C between September 1963 and December 1965. The single lens nose headlight makes this U25C's shell correct in general for the Northern Pacific. The Louisville & Nashville; LS&I; Pennsylvania and Oro Dam U25C diesels had no nose headlight. The ACL and CB&Q U25C diesels had a two lens headlight on their noses. 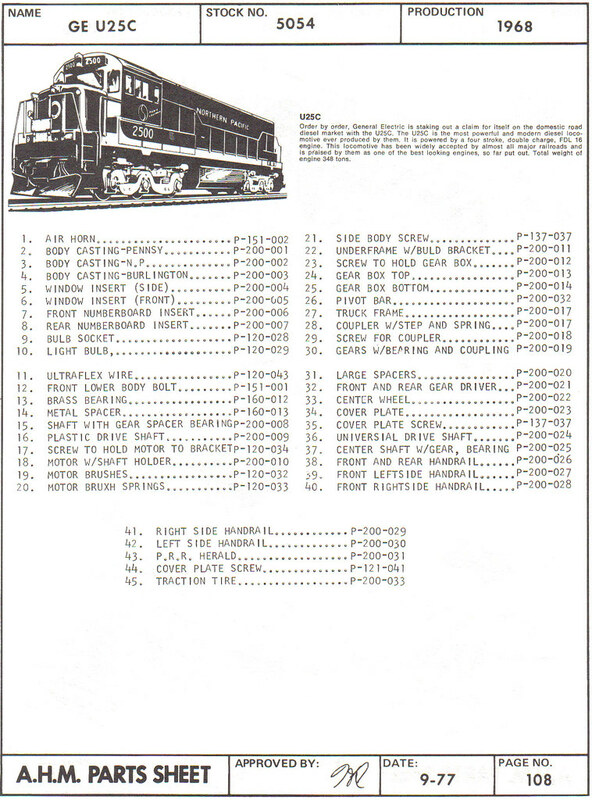 General Electric's production of U25C diesels included three phases, according to a review of this model in the January/February 1993 edition of Diesel Era magazine. The AHM model includes the larger fuel tank, which was not part of the Phase I features. The louvers located behind the cab on the long hood appear to put the shell in Phase II territory. Owners of the Phase II body, included ACL, Oro Dam, LS&I, and NP. Given the already noted Northern Pacific style single lens nose headlight, the Rivarossi-made shell represents the NP Phase II U25C example. The Northern Pacific purchased two groups of U25C's from GE. The first set, numbered 2500-2514 were Phase II bodies. 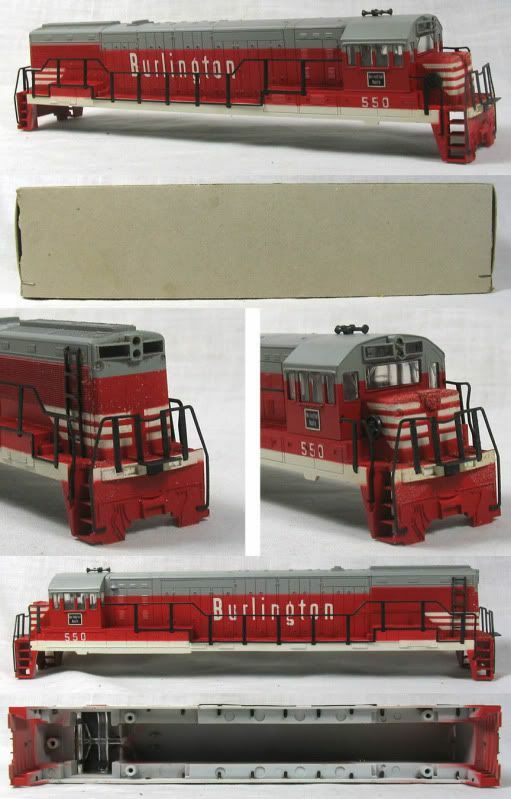 These NP U25C's would survive into the Burlington Northern in the 1970s. The Phase III U25C is noted as the most common by Diesel Era magazine. 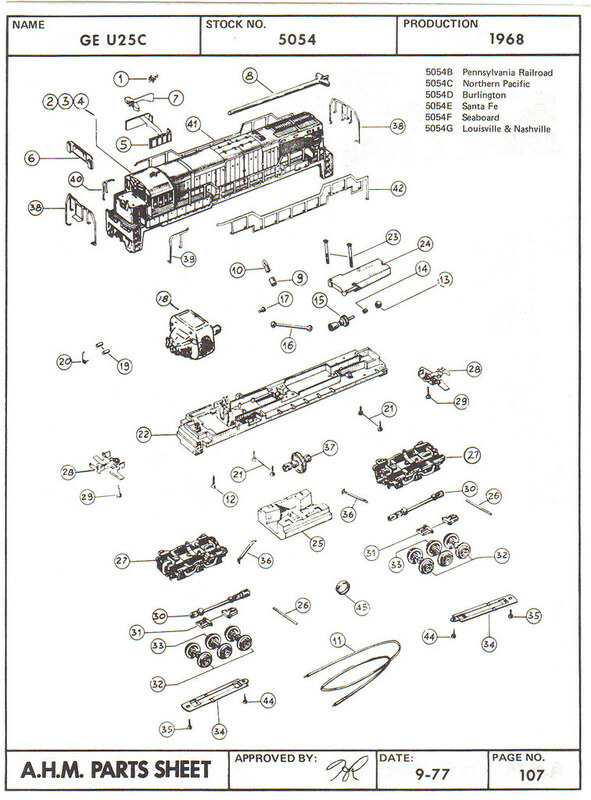 Above is AHM's parts diagrams for the GE U25C. You may click on any thumbnail image to open a large version for best viewing. 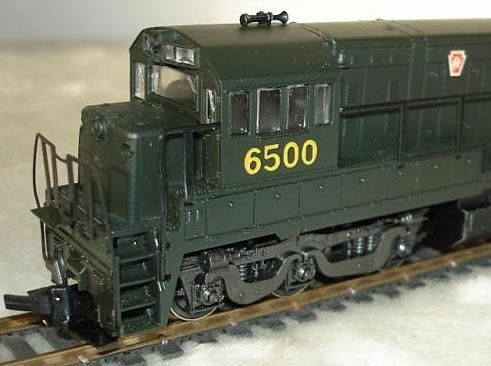 You may view a 1971 HO Diesel Comparison between Athearn's SDP40, AHM's U25C, Bachmann's GP40, and TYCO's GP20 from Railroad Modeler magazine by clicking on the cover above.